How were the Knicks going to respond to that disgraceful 40-point thrashing at home to the Boston Celtics? With another double-digit loss, of course. Carmelo Anthony and Amar’e Stoudemire gave strong efforts, but found themselves failed miserably by their guards, who couldn’t score or play adequate defense as Kyrie Irving had his best game of the season (37 points, 11 assists). This second straight defeat puts the Knicks back at square one regarding the questions about their mentality and unquestionably puts Mike Woodson back on the chopping block (who says he ever left it?). VINTAGE BAD START: The Knicks went all out in trying to duplicate the horrific first quarter of the Celtics game. They gave up 16 free throws and were at one point down 27-9. They ended the quarter in a 31-19 hole,. but tightened up their defense in the second behind the inspired bench play of Stat (15 points). A Melo three-pointer got them within a point (46-45), but then a bunch of pounding and plodding isolation plays stalled the offense and allowed the Cavs to hold a small 48-45 lead at halftime. 3RD QUARTER MELTDOWN: Melo had 7 early quarter points and the team was well within striking distance. Then the team inexplicably started playing foolish. Everyone got three-point happy, in addition to not boxing out on rebounds nor guarding the perimeter. Irving abused Raymond Felton and Pablo Prigioni for 12 points in the quarter and the Cavs frontcourt got several putback slams off missed jumpers. The Cavs were draining their own threes and before long the deficit had ballooned to 73-60 off a Irving crossover and pullup trey on Prigioni. The last putback dunk on the Knicks had Melo throwing his hands up in exasperation at his team’s effort. When the smoke cleared, the Knicks took a 81-65 deficit into the fourth. NO BETTER IN THE LAST 12: The fourth quarter was no better. 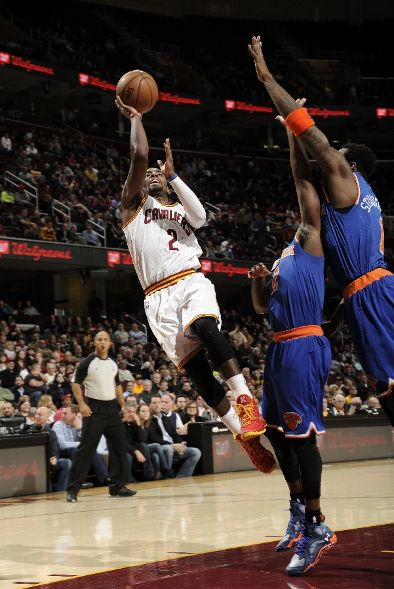 The Cavs pushed the lead at one point to 19 (88-69), and basically rode the hot shooting of Irving, who made the game into an Uncle Drew exhibition on our hapless Knicks guards. BLAME MELO? PLEASE…: Games like this serve as a perfect example of why blaming Carmelo Anthony for the wretched start to the season is so ridiculous. The man’s stat line was 29 points (12-19 shooting), 8 rebounds and 3 assists. Sure, Melo is far from perfect. He doesn’t have the best instincts with his help defense, and of course he gets into volume-shooting habits too much at times. But from day one, he’s been our most consistent player in terms of effort and contributions. The guard play was abysmal and with Bargnani having a cold shooting night (11 points, 5/17), Melo’s effort was essentially wasted. STOUDEMIRE: Amar’e defense and rebounding will always be an issue, but he at least put up points last night and had two great blocks at the rim. He played 27 minutes and had 17 points on 7/10 shooting. If his knees hold up (stop laughing), he could end up being our bench lead as originally intended. The bleeding likely continues tonight as the Knicks face the Bulls.